A treatment for when saving time and looking radiant are equally important. You will be amazed at what can be achieved in 40 mins. The latest sonic technology is used to cleanse the face and neck area. This form of cleansing gives unparalleled results which then leaves the skin ready for the herbal face mask followed by the toner and moisturiser. You will feel and see the difference! Choose between the Seaweed facial mask treatment (ideal for oily skin / blackheads) or the Natural Collagen Extracts mask (great for normal or dry skin). 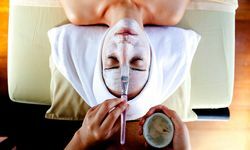 Revive your skin and regain youthfulness with either of these unique facial treatments using only natural products. Either way your skin will have a healthy, smooth looking complexion after a delightful 90 mins of pampering.